For tourists in Seoul, which neighborhoods do they just have to explore? The recently published “Top 30 Famous Alleys in Seoul” will guide the intrepid diner to 30 alleyways across the metropolis that are full of delights to eat, see and enjoy. The guide book, available in Korean, English and simplified Chinese, spotlights a select group of must-visit neighborhoods in three categories: Food Alleys, Party Alleys and Sightseeing Alleys. 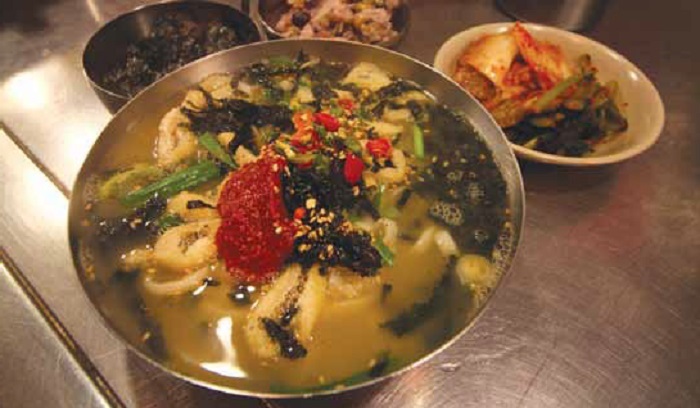 Each category features 10 spots.In the Food Alleys section, there is the noodle soup alley in Namdaemun Market, a bossam alley in Jongno 3-ga and a cafe street in the Seorae Village. The Party Alleys section features Insa-dong in Jongno-gu District, Garosu-gil in Sinsa-dong and the so-called “K-Star Road” in Cheongdam-dong. 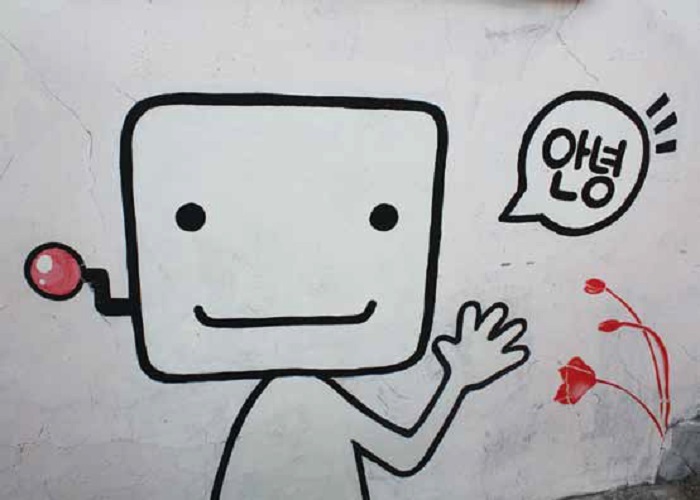 Among the Sightseeing Alleys, there is Jaemiro in Myeong-dong, the Gangpul Cartoon Alley in Gangdong-du District and the Ihwa Mural Village in Ihwa-dong. Here are some of the selected neighborhoods. A hearty bowl of kalguksu. 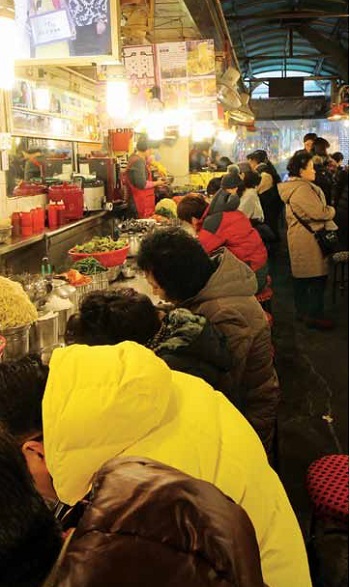 Entering Namdaemum Market, a bustling open-air shopping district in Jung-gu District, Seoul, it’s common to see people hunched over enjoying a bowl of noodle soup, known as kalguksu. Shoppers enjoy a bowl of noodle soup along Kalguksu Alley in Namdaemun Market. 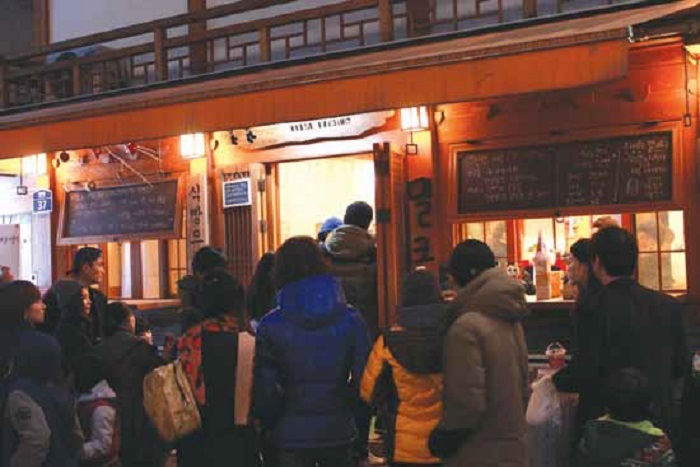 Not only noodle soup, but boribap, a bowl of boiled barley, and naengmyeon, a cold noodle dish, are served here, too, satiating shoppers’ hunger. The kalguksu noodles served here are famous for being handmade. Restaurants have generous servings and moreover, the price of a meal is only around KRW 5,000 to 6,000. How to get there: Leave from exit No. 5 of Hoehyeon Station on subway line No. 4. Go straight about 50 meters and then turn left. One of the most crowded stores along Palpan-gil in Samcheong-dong sells soft milk bread. Palpan-gil in Samcheong–dong is one of the oldest streets in the city. The street got its name when eight royal ministers lived there during Joseon times. With a relaxing ambience and generous hospitality that can be felt across the neighborhood, it retains a constant flow of tourists. The street is also home to numerous well-known restaurants and cafes, specializing in croaker fish dishes, tarts and soft milk bread. How to get there: Leave from exit No. 1 of Anguk Station along subway line No. 3 and go past the Samcheong Police Stand, up toward the National Folk Museum of Korea. Usadan-gil in Yongsan-gu District still has some of its time-honored charm. 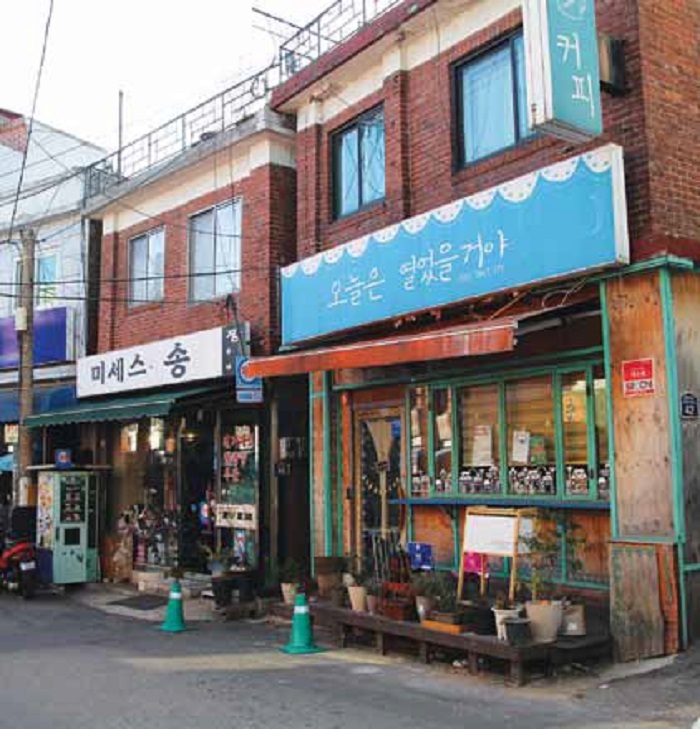 Itaewon in Yongsan-gu District is home to a small alley called Usadan-gil. The street’s name is derived from the usadan (우사단, 雩祀壇), an alter created to conduct rain rituals during the reign of the third king of Joseon, King Taejong (1367-1422). Nowadays, the greatest charm of this street is the exquisite harmony between the old and new. Next to an old barbershop is a coffee shop that gives off an aroma of fresh coffee from its state-of-the-art machines. The neighborhood used to be a shantytown. However, as young, promising artists opened studios and galleries, one by one the street has become artistic. Nice cafes and cozy restaurants welcome visitors there. How to get there: Leave from exit No. 3 of Itaewon Station along subway line No. 6 and go straight. Usadan-gil is in front of the mosque. 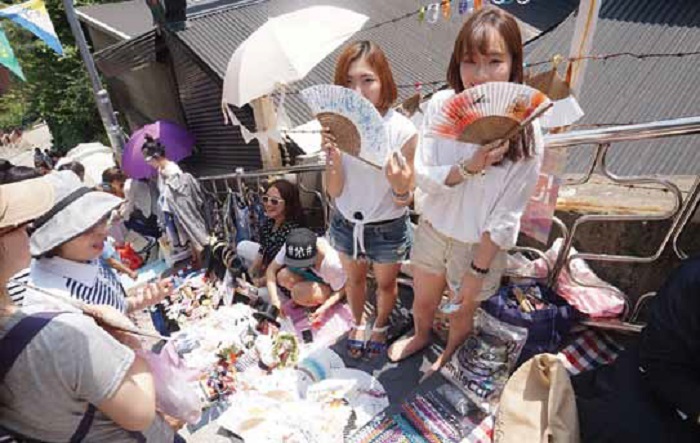 A weekend market opens along the steps in Usadan-gil in Itaewon. A cafe along Buamdong-gil in Jongno-gu allows visitors to sip their coffee while they enjoy the landscape that unfolds before their eyes. Buamdong-gil in Jongno-gu is located to the northwest of Gyeongbokgung Palace and is one of the book’s must-visit tourist sites. This is where people come to have a short getaway, surrounded by nature. 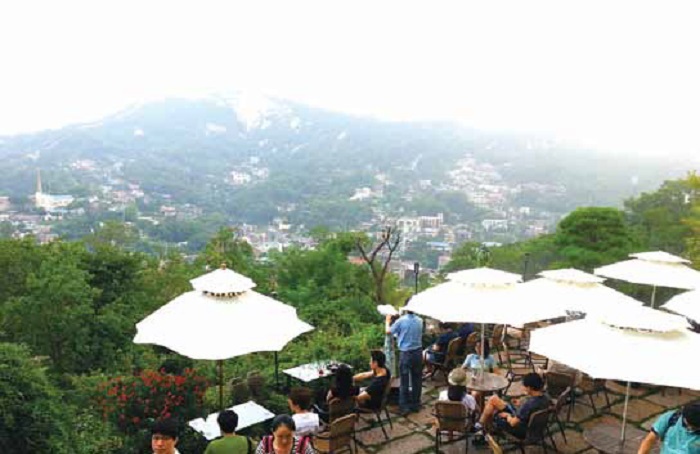 The nearby Buaksan Mountain and Baeksasil Valley emit much-loved fresh air and form a scenic landscape, offering the perfect environment in which to enjoy a sip of coffee surrounded by nature. Every corner of the street houses small cafes and intriguing galleries, galleries that feature little figurines made out of chopsticks and wax. How to get there: Leave from exit No. 3 of Gyeongbokgung Station along subway line No. 3 and get on either bus No. 7212, 1020 or 7022. Get off in front of the Buamdong Community Service Center. 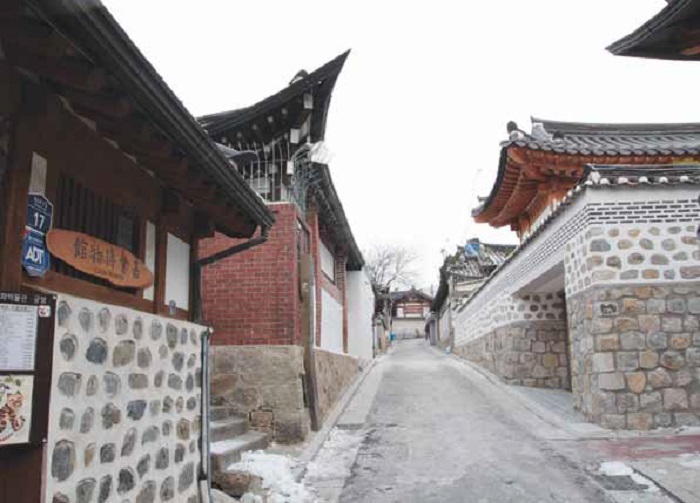 The Bukchon Hanok Village in Jongno is famous for its traditional Hanok homes. The Bukchon Hanok Village in Jongno-gu is one of the few neighborhoods in Seoul that still maintains its traditional Hanok buildings. Tourists here can experience a traditional lifestyle by staying in one of these Hanok houses equipped with an ondol under-floor heating system. These B&Bs allow many of the Hanok guesthouses to remain in business here. There are also workshops that offer a glimpse into how craftsmen make their traditional handiworks, such as pieces of embroidery and knots, as well as some traditional Korean dishes. Visitors can enjoy a hands-on experience alongside the artisans. The neighborhood is almost always thronged with many tourists, as it has numerous sites to enjoy, including vendors selling cute accessories and buskers singing and performing on every corner. How to get there: Leave from exit No. 1 of Anguk Station along subway line No. 3 and walk straight. 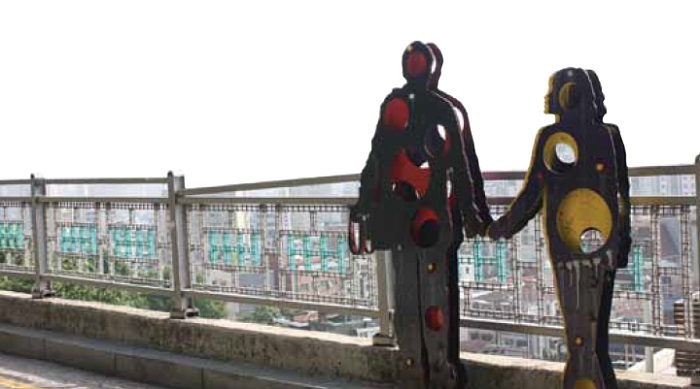 A human-like sculpture stands in the Ihwa Mural Village in Ihwa-dong, Jongno. The Ihwa Mural Village in Ihwa-dong, Jongno-gu, is adorned with colorful and differently designed murals on its walls. Several decades ago, the area was a manufacturing center for clothes, beddings, curtains and accessories sold at Dongdaemun Market. As redevelopment plans kicked off in early 2000, residents moved elsewhere and so the vitality of the neighborhood drained away. That’s when the area tried to make an effort to become colorful, so as to regain some of its lost vibrancy. About 68 artists moved to the neighborhood, painting murals on the walls and constructing installation artworks. Now, the area has turned into one of the city’s most-visited tourist sites. People stop by the neighborhood to take a look at the works of art and to learn about the history of the place, as well as to feel the generous spirit of the residents. How to get there: Leave from exit No. 2 of Hyehwa Station along subway line No. 4. Walk straight toward Marronnier Park. A painting on the wall greets visitors to the Ihwa Mural Village.